of the new technologies in public primary education. introduction of new technologies in primary education. Kiridis, A., Drossos, V. & Tsakiridou, E. (2006). Teachers Facing ICT The Case of Greece. Journal of Technology and Teacher Education, 14 (1), 75-96. Chesapeake, VA: Society for Information Technology & Teacher Education. Retrieved April 18, 2019 from https://www.learntechlib.org/primary/p/5361/. Dawes, L. (1999). First connections: Teachers and the national grid for learning. Computers and Education, 33 , 235-252. Drossos, E. (1998). The current policy for the use of ICT in primary education. Implication for initial teacher education. Unpub l ished masters dissertation, Lancaster University, Bailrigg , Lancaster, UK. Fullan , M. (1991). The new meaning of educational change. New York: Teachers College Press. IP.E.P.TH. (1997). General context for the study of ICT. Athens: Pedagogical Institute (in Greek). IP.E.P.TH. (2000). Preparing teachers for the society of information. Inservice teacher training on ICT. Athens: Pedagogical Institute(in Greek). Javeau , J. (1996). Doing research with questionnaire. Athens: Tipo th i to G. Dardanos (in Greek). Kapa, E. (1999). Problemsolving, plan ing ability and sharing processes with LOGO. Journal of Computer Assisted Learning, 15(1) , 73-84. McK insey (1997). The future of information technology in UK schools. London: McK insey & Company. Mumtaz , S. (2000). Factors affecting teachers’ use of information and communications technology: A review of the literature. 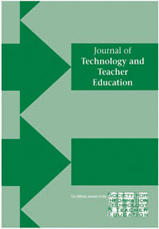 Journal of Information Technology for Teacher Education, 9(3), 319-341. Spanaka , A. (1999). Factors influencing student teachers’ attitudes towards the use of ICT in education. Unpub l ished masters dissertation, Crete University, Rethimno , Crete (in Greek). Underwood, J. (1997). Breaking the cycle of ignorance: Information technology and the professional development of teachers. In D. Passey& B. Samways (Eds.) , Information technology. Supporting change through teacher education. London: Chapman& Hall. Watson, G. (1997a). Preservice teachers’ views on their information technology education. Journal of Information Technology for Teacher Education, 6(3) , 255-270.